» Jobs - Why Study Economics? In this short video from the Royal Economic Society, Gill Wyness of University College London explains the long-term financial benefits to individuals who do a degree. Bear in mind that the benefits are especially high if your degree subject includes economics, as you can see elsewhere on our site. 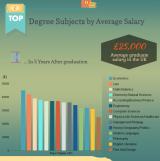 The Market Inspector blog has posted an infographic to answer the question “what degree subject is most likely to get you hired with a good salary?” Using data from emolument.com, they found that economics comes out top of subjects taken in the UK, going by average salaries five years after graduation. This won’t be a surprise if you’ve read our previous posts on the topic. The infographic gives another statistic that we hadn’t heard: eight percent of the world’s billionaires took degrees in Economics! What are the opportunities available to students studying economics? If you are in the second or final year of your economics degree and interested in securing an internship or graduate job you will be faced with a bewildering array of options. To give yourself the best chance of securing a role you must focus on applying to one industry and know that industry like the back of your hand. Submitting applications across a variety of industries should be avoided because it is not time effective. Below is a list of sectors that seek to employ economists every year. This list is by no means exhaustive but it should give you an idea of where to focus your time and efforts.